Godzilla is one of those film legacies, a little like James Bond, who managed to collapse retro chic with contemporary perspective due to several key happy accidents of politics and style throughout the years. The original 1954 Honda film carried its anti nuclear War themes (it was made only nine years after the bombing of Hiroshima) intelligently, while including a question about the role of God in Nature and man’s relationship to both, something that gives the original a timelessness because it taps into an intellectual zeitgeist that exploded over the next five decades. Add to that the creation of a monster “God-zilla’ who behaves specifically according to its own evolved morality, an accidental Frankenstein’s monster, and you have the stuff of legend, which as we now all know sixty years on, is exactly what happened. Unlike a James bond film, you can’t get a Godzilla film wrong, the clunky and ridiculous being as much a part of the preserved legacy as the inquiring 1954 original. Part of Godzilla the monsters charm lays in his ridiculousness, the fact that it (it’s been both male and female) can get away with the cheeziest of graphics and an entire generation will venerate the effort as the niche market of b-grade film passion sweeps through hipster land, and has even forgiven and embraced (to a degree) the 1998 shocker that saw Matthew Broderick being chased around by a Jurassic Park style reptile, for retaining the comic spirit of the treatment of great screen legend. 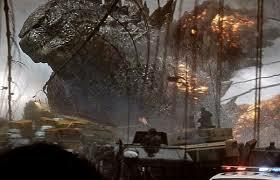 So when Gareth Edwards is bankrolled by Warner Brothers to make another American Godzilla, it joins the franchise that is loved despite film quality, but at the same time, the American blockbuster aesthetic is not one so easily plastered over the top of the Godzilla franchise, as 1998 film revealed. So you have a choice of several roads to follow: fan-film, serious Americanised remake, or indie style “definitive” exploration loaded with meta narrative a-la The Lego Movie. Gareth Edwards chose a little from column A and almost all from column B thankfully leaving column C alone, so in many ways, what we really have here is the third American version of Godzilla – the fourth if you include the first in 1954 that was directed by Ishiro Honda himself, which I don’t think really counts – an in some ways the cemented start of an appropriation whose trajectory seems set for several decades to come. This Godzilla film is a stake in the claim of the monsters longevity, and you can almost hear Warner Brothers smirking and rubbing their hands, and Edwards seeing himself as a long-term American version of Honda. Franchises work for Hollywood, so in many ways Godzilla was a great film waiting to happen. A-listers appear, in the case of Juliette Binoche for less than fifteen minutes, and in the case of Sally Hawkins with little more to do than be a supportive background, but its their intellectual capital that brings the required clout to the film in order to boost it into something worth observing seriously. 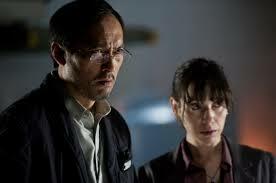 Plotting is complex and includes a lot of socio-political underpinnings with imagery taken from famous disasters such as Fukushima, but the script remains a touch elusive, almost as if the film has been made to be watched many times rather than successfully grasped the first time around – in this way it gains longevity as well as appealing to die-hard fans who will recognise so much of the original spirit of Godzilla manifest in this version. 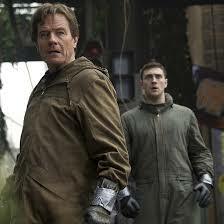 If Godzilla has a flaw, it is in its combination of disaster movie and/or monster movie. The two genres are not alike, disaster films need a strong human interest component and this Godzilla is missing that narrative sub plot, in favour of letting the monsters duke it out over the city, which is a premise truer to the original. The human creatures are incidental to what is happening, the real action, and the steps nature is taking to restore balance occur away from human interest, but Godzilla has a bet both ways, so that we are teased with a bit of the personal around Ford Brody (Aaron Taylor-Johnson) and Elle Brody (Elizabeth Olsen) and their background relationship to his parents (Juliette Binoche and Bryan Cranston) but not enough to root for them when the monsters start to attack – which makes sense given the monsters are attacking each other, not humans. The back story is long and involved while using a Spielberg-esque Jaws like suspense to herald the onset of the creatures, and interestingly it is Godzillas enemies we see first, but this still renders the arrival of the monsters as something of a confusing anti-climax and the tensions build toward uncovering the truth of Godzilla is buried under a mass of evocative, truly stunning imagery that can be a distraction at crucial moments. There is a fluid tension to the beauty of the monsters desecration of the city, that at the same time a leads away from important plotting points that might be obvious to a devotee but leave the uninitiated already conditioned to disaster film, confused by some of the protagonists motivations. All this while juggling the multifarious references to relevant historical matter and other films. 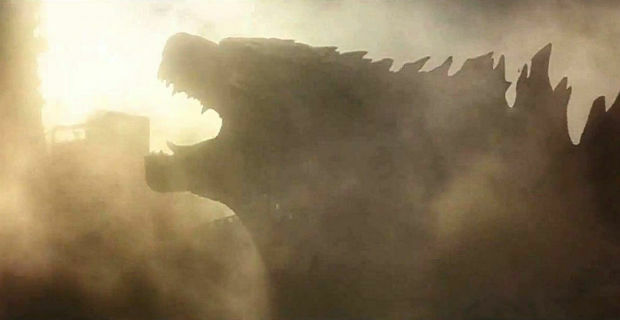 This version of Godzilla has its own elegant beauty and is worth seeing for that, but there is an overwhelming sense that this will not be your last opportunity to see this great monster duke it out with its enemies on our giant screens, thanks to an American vehicle of some sort.